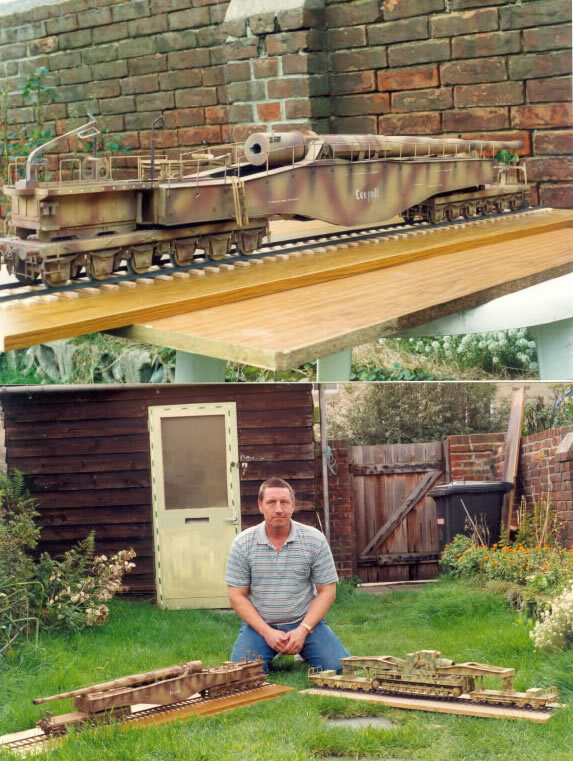 The Trumpeter kit of the BR52 had been used in a scaling up project and when we had finished with it, I thought it would make a change to convert it to an earlier BR43. I had a couple of photos and the small Revell kit, so with some plastic card and a lot of modellers licence, I built what I hope looks something like the BR43. 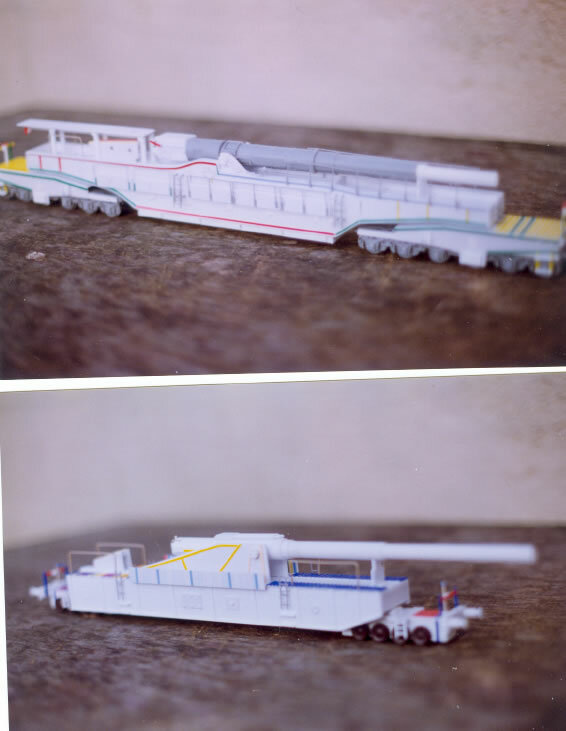 This model was the last one in a set of nine railguns which then led to the 1/16 scale Dora being built. I never kept many photos of this 1/35 scale version, but this few may give you some idea. 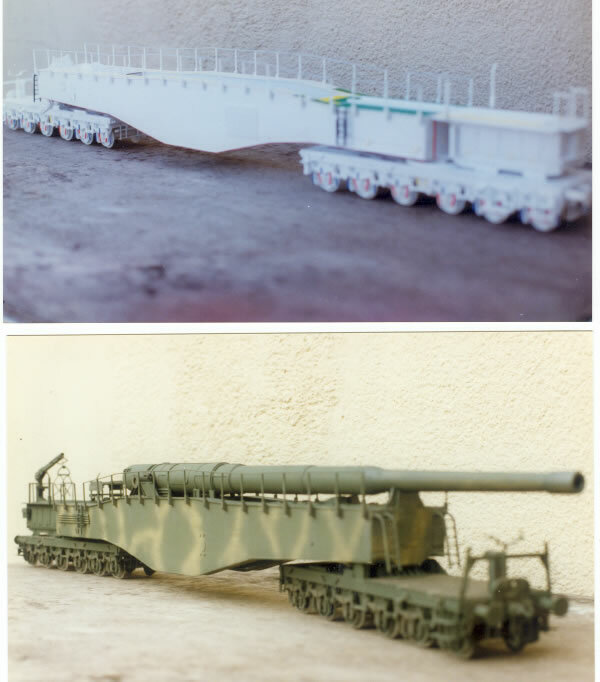 A couple of years back I got hold of 2 damaged K5 railguns in 1/72 scale from Hasagawa and decided that as I had never built anything in this scale, to make up three french railguns and put them in a basic diorama setting. 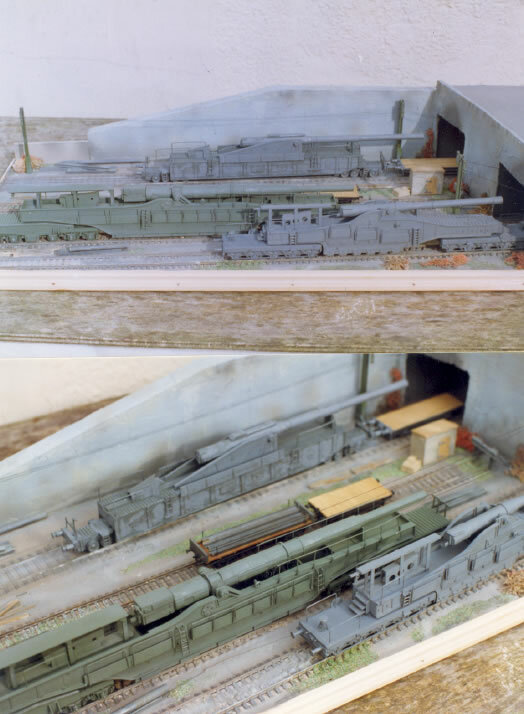 I saw a couple of good photos in the Squadron book showing a goods yard and copied it as near as possible but adding a bridge and some bits and pieces along the track sides, the models were made fairly simplified from the usual thin card, strip and rod and the kit wheels used, the lengths of track were from a friend’s old rail layout. 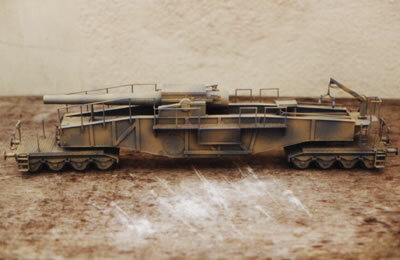 This model was part of a customers set of guns, some of which are on these pages, before this one I had built a 1/24 model and made some of the masters for a 1/15 one released by Frontline Miniatures a few years back. 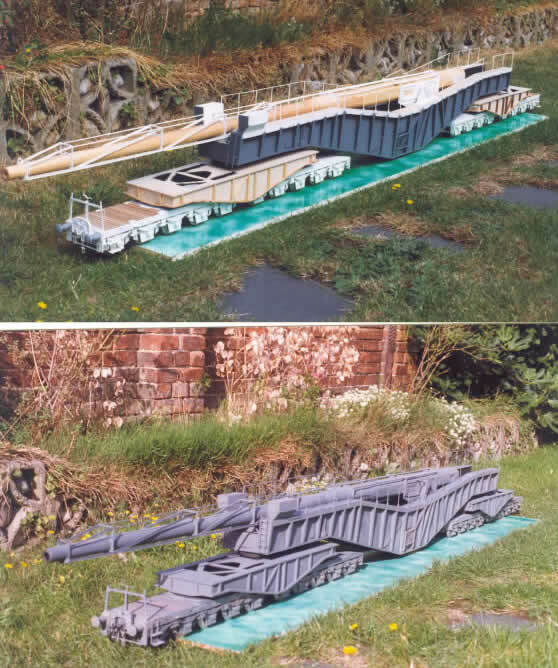 I thought this would be an end to railgun madness, but now Dragon have released one and I will have to get it….Oh no not again!!! 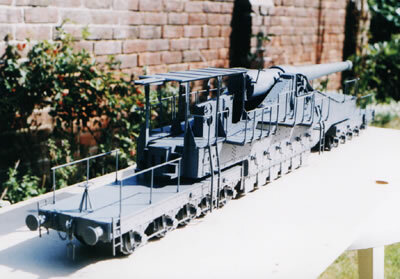 The same nutter ( oops customer ) who had the set of 1/35 railguns also had a 1/15 K5 and decided that the K12 would compliment it nicely. 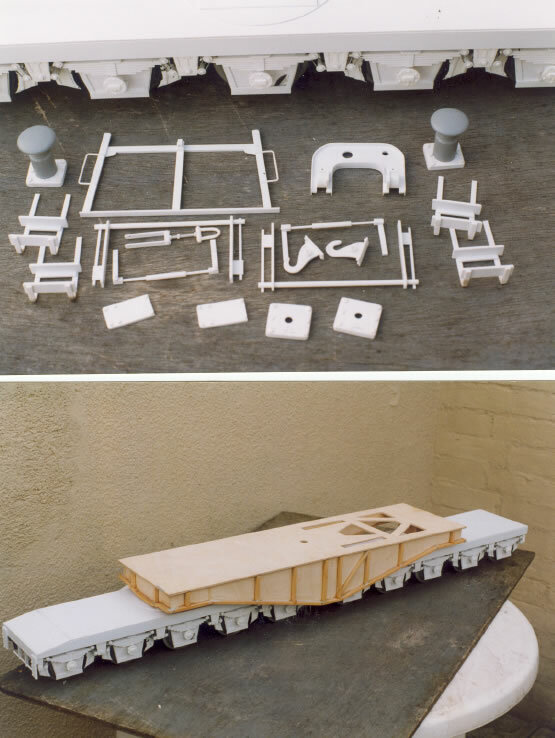 He made all the centre main carraige from 1/2 inch ply wood, the truck bolsters from 1/4 inch ply and the wheels he turned again from plywood, he then sent all the parts to me for detailing, the springs are from 1/4 x 40th strip and the axle boxes from square and round tube, brakes are from card and strip and the truck tops and sides are from 60th card. The barrel trunnion housings are from 30, 40, and 60 card with strip details, the barrel is again turned from wood. The paint is Panzer grey, not pink as it appears !! 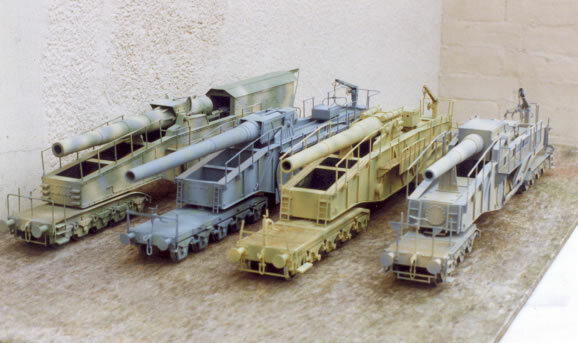 The 1/35 scale set of German rail guns made for a friend that was started about three years ago, and finished with the 80cm Dora (M.M.I. August 99),was not my first dabbling with these monsters it really began about a year before when I planned to do a 1/16 scale diorama. 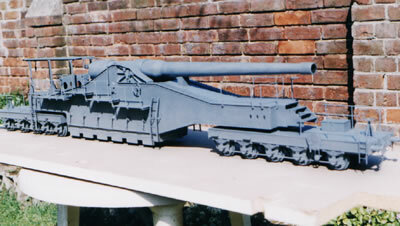 It was to feature a section of platform, a length of track and a couple of German figures standing next to a captured French rail gun. 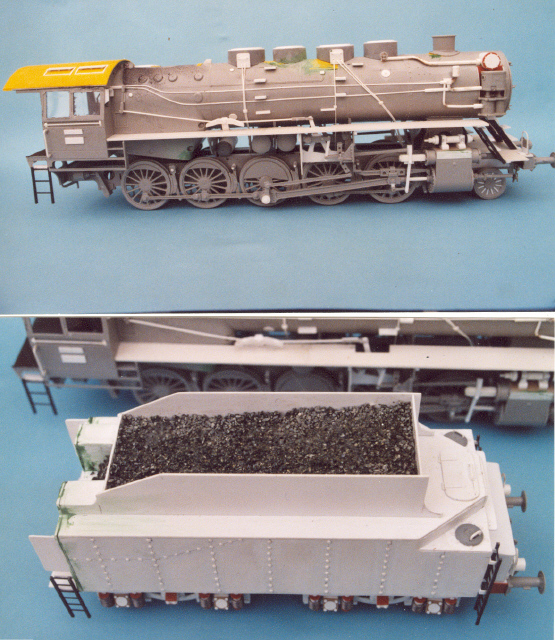 The model would be a “straight nick” from one seen in a Verlinden publication that had been made by Lewis Pruneau. 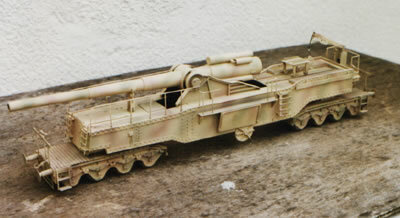 The model chosen was the one designated M74(f) by the Germans and which is in a couple of photos but also has a line drawing all in the Signal book “German railroad guns”, it also gives the overall length ,barrel length and calibre. 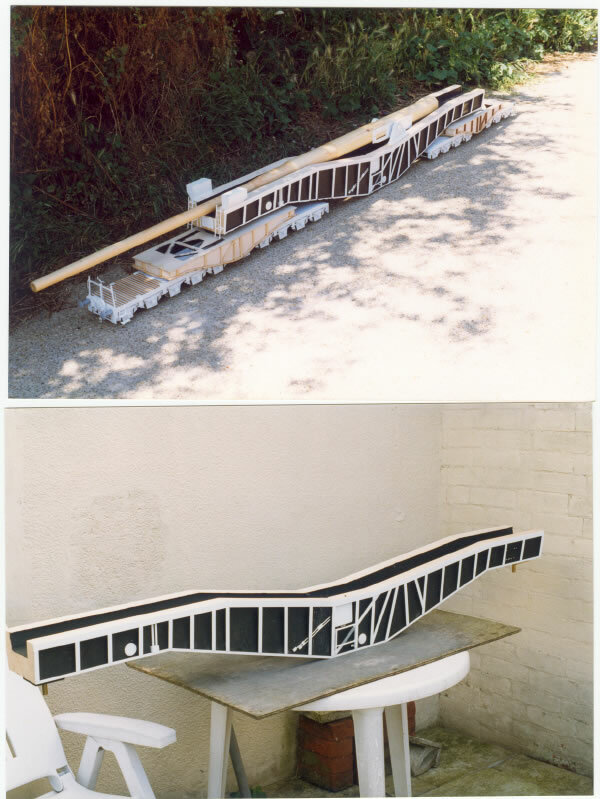 I started by making twenty wheels from laminated card making a slightly bigger one for the flange and wrapping a piece of 5/16 wide strip around for the tyre,the leaf springs are l/4x6Oth strips, and the axle boxes are from 1/2 inch tube with card discs. The main side drops are 60th card and are in a stagger pattern,these were edged with thin strip and a piece of 1/8x3Oth card runs along the bottom of all axle drops. 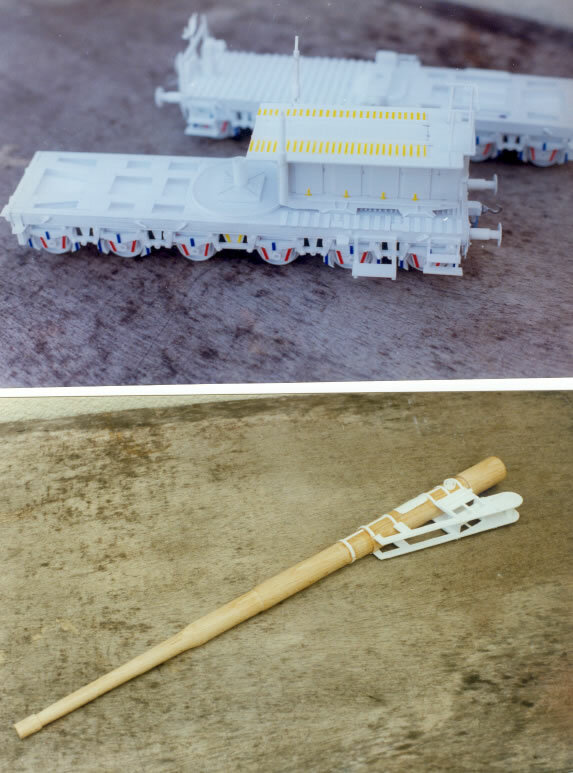 I then made the brake shoes and arms which only need eight of each hand as only four wheels of each truck are braked.The next thing to do was make the truck tops,these were made two pieces of card with a 3/4 inch edging to allow for the truck sides, now all the ready made parts were added as were all the rivets from sliced up 1/16 rod. The buffers are from 1/2 and 3/8 inch tube with 7/8 inch discs and backing plates from 60th card and 2mm hex bolts. The couplings are 3/32 tube,3/l6square and 1/16 rod thehooks are shaped 60th card,all rivet and bolt detail was then added to the front and back plates. 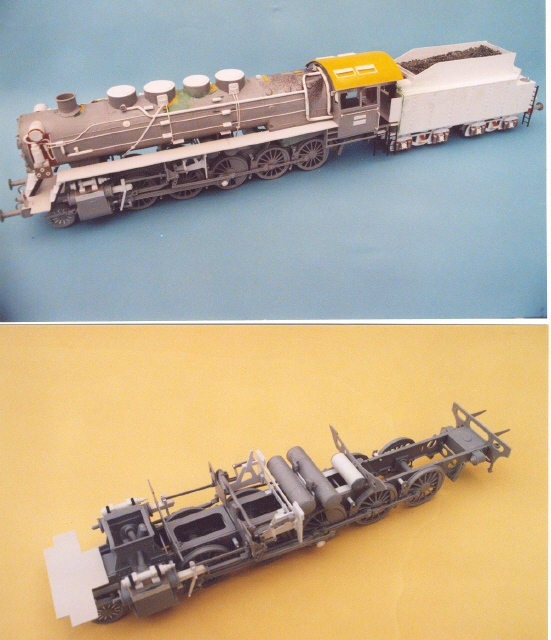 (Side Shot) The top coupling pin plinth on each truck is from 1/4×40 strip and 40th card,the front section of each truck is covered with diamond pattern tread plate and the tool/spares box on the front truck is from 40 and 60th card.On the front truck is also what appears to be a hand cranked chain driven device,I have no idea what it is but I made a near as possible copy of it from card and strip and fitted them to the sides of the truck. The main centre carraige was made copying a cardboard template from 60th card with 5/8 inch spacers into two sides, these were then fitted together with 60th bulkheads one at the back,one front,and two set near the middle, the tops of each side run was then covered with linch wide strips of 30th card along the whole top and bottom length. The barrel was made by a local woodturner and coated with varnish, the breech details were added from various strip and rod, all the other details were then added, the end steps,side walkways,handrails as before,side ladders. The final job and one certain to do the brain in was all the side rivet detail, as before these were from sliced up 1/16 rod and glued on in sections at a time. The model was painted in shades of grey based mainly on lrlumbrol no.27, the whole thing was then airbrushed to a semi-matt finish as it seems to be in the photos (but I still want a diorama).